Last Saturday saw the naming in Singapore of ultra-luxury line Seabourn’s latest addition, the 604-berth Seabourn Encore. With an extra deck, the new ship will be able to accommodate one-third more passengers than the Seabourn Quest class of ships that preceded her. 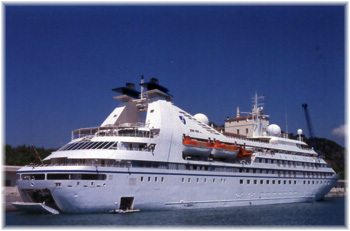 Through an acquisition by Cunard and in turn Carnival’s acquisition of Cunard, Seabourn became part of Carnival Corp & plc, for whom she has now been introduced as its newest ship. Carnival itself was founded in 1972 when Mardi Gras entered service from Carnival Cruise Lines from Miami. The new ship is almost half again as large as Mardi Gras in tonnage, although only 6% longer, and carries only two-thirds the number of passengers. The mood at All Leisure group’s cruising ventures is one of uncertainty, along rumours that at least one of their ships, if not two, could be going to other operators. Unconfirmed reports say that potential buyers inspected Voyager during a recent dry-docking at Keppel shipyard in Singapore. 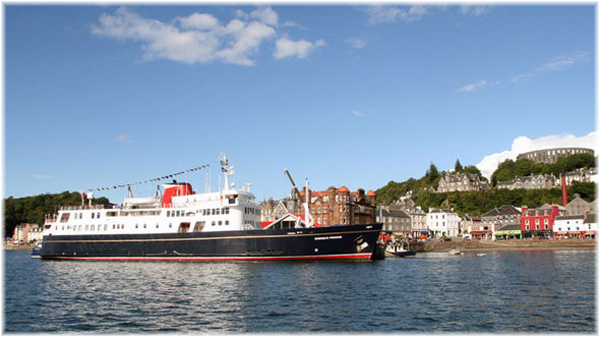 Meanwhile, representatives of Sea Chefs, who operate the vessel’s hotel services, are said to have flown in from Germany to address crew members. All Leisure left the the stock market last year after months of tough trading conditions. Its turnover for the year to October 2015 was °Í127.3 million, down from £138.9 million a year earlier, but the group did make a £500,000 profit compared with a £7.5 million loss the previous year and a £13.2 million loss the year before that. Oceanwide Expeditions, the Netherlands-based polar cruise company, announced that it had ordered a new 180-berth expedition ship. To be called tHondius, Oceanwide claim that, although she will be the fifth such ship to be built to the class, she will be the strongest ice-strengthened expedition vessel operating in polar regions. She will be built by Brodosplit in Croatia and is due to enter service in 2019. 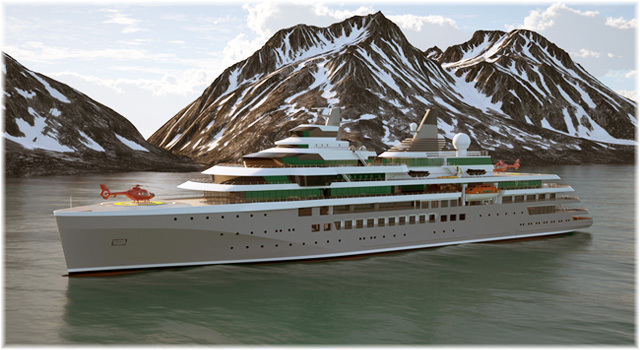 Hondius was specially designed to serve Oceanwide’s exploration programmes and to support its activity-based shore excursions in the Arctic and Antarctica. She will be rated Polar Class 6, and will be the fifth ship to be built to this specification, after Scenic Eclipse, Crystal Endeavour and two new ships for Hapag-Lloyd. As it happens, Scenic Eclipse is also being built in Croatia, but at the Uljanik Group’s yard in Pula. Hondius will be 350 feet long with a beam of 58 feet, and will have a service speed of 15 knots. Virgin Voyages owner, Sir Richard Branson, and president and ceo, Tom McAlpin, said that thousands of people had shared their wishes for an ‘irresistible vacation at sea,’ and the new name derived from that. Posted in Caribbean, Virgin Voyages | Tags: "cruise People"
Damen Shipyards Group has revealed its design for an expedition cruise ship. The design also draws on the skills and expertise of Expedition Voyage Consultants Ltd and the Danish Naval Architect firm Knud E Hansen. 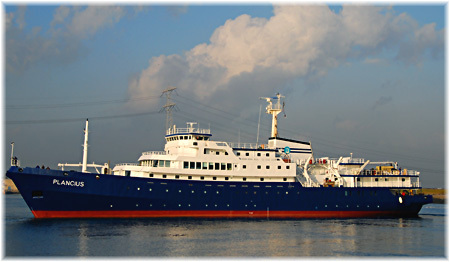 The ship has been designed for expedition operations in both remote polar and tropical regions. The vessel’s Polar Class 6 compliance and 30 days autonomous cruising capability ensure she is globally capable and able to tackle challenging, far-reaching itineraries. And vessel’s design complies with SOLAS Safe Return to Port requirements. Passengers will have views from multiple viewing platforms extending over the side of the ship or past the bow, providing the most spectacular vantage points of any expedition ship. A specially developed crow’s nest will also aide visibility during ice navigation as well as giving passengers a panoramic view over the surrounding landscape. The design can accommodate 115 passengers, although it can be scaled up to 200 passengers or more. Damen has selected a diesel-mechanical hybrid configuration for propulsion with medium speed engines. The service speed is 16 knots. Royal Caribbean Cruises has ordered two new 5,000-berth ships that will be powered by liquefied natural gas (LNG). These ships are expected to run primarily on LNG but will also be able to run on distillate fuel, to accommodate occasional itineraries that call on ports without LNG infrastructure. The ships will be operated by Royal Caribbean International. The company said it signed a memorandum of understanding with shipbuilder Meyer Turku for the new class of vessel under the project name “Icon”, to be delivered in the second quarters of 2022 and 2024. The company will also be introducing fuel cell technology on board, which it will be testing on an existing “Oasis” class ship in 2017, and will run progressively larger fuel cell projects on new “Quantum” class vessels being built in the next several years. According to a press release by Meyer Turku the ships will measure around 200,000 gross tons, producing a passenger a space ratio of about 40 tons per passenger. By comparison, Harmony of the Seas has 5,479 lower berths and measures 226,963 gross tons, producing a space ratio of 41. This latest order means a substantial order book for Royal Caribbean. Two more “Harmony” class sisters, two “Quantum”Class sisters, two “Icon” class ships and four “Edge” ships for Celebrity Cruises, a total investment of $9 billion. The Daily Mirror’s Captain Greybeard, otherwise known as John Honeywell, seems to have been the first to have noticed that Crystal Cruises’ ambitious expansion plans are being slowed down. 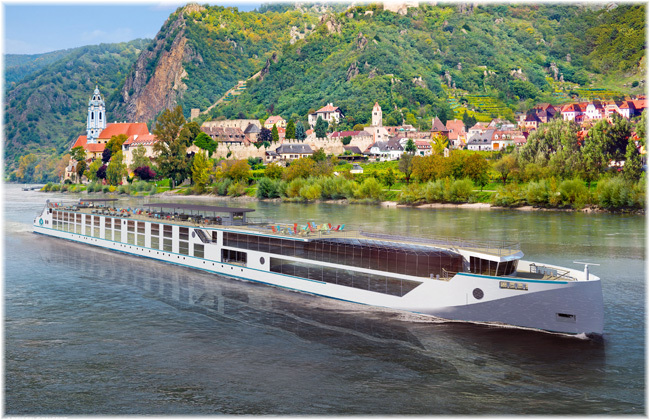 Crystal River Cruises was the first to delay its launch in France with Crystal Debussy and Crystal Ravel, which were originally due to travel the Seine, Rhone and Dordogne beginning in June and August 2017. Instead, there will now be four newly-built river yachts on the Danube, Main and Rhine. The change means a redesign for the yachts that were intended for France. 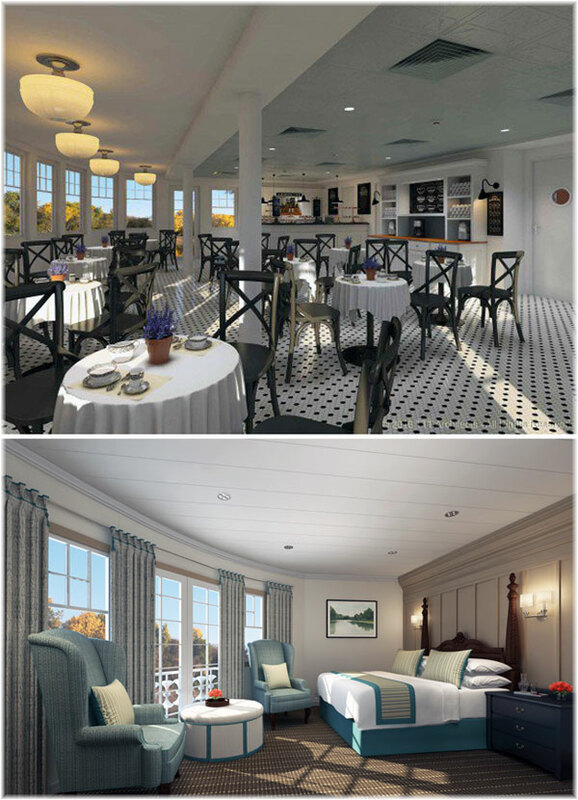 The increased length will allow for the addition of a swimming pool with a sliding glass roof and more of the ship’s larger suites, which range in size up to 759 sq ft. Crystal Bach and Crystal Mahler, in the line’s 106-guest Rhine-class series, are due to enter service June 18 and August 29 2017 respectively. Crystal Debussy and Crystal Ravel will now follow in April 2018 and May 2018. While work progresses on what will be six new river ships, he arrival of the line’s first new expedition ship and the first 1,000-passenger Exclusive-class ship have been also deferred. 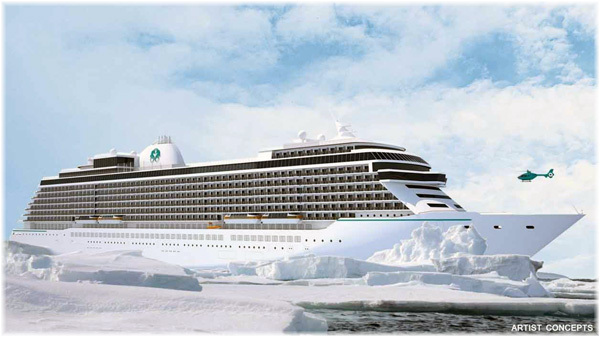 Polar expedition ship Crystal Endeavour was scheduled for August 2018 but will not now appear until 2019. Meanwhile, there are hints that Endeavour will be joined by another expedition vessel. The Exclusive class ship has already been postponed by a year from late 2018 and has now been put back two more years, to 2021, and there is no word on when her promised two sister ships will be completed. 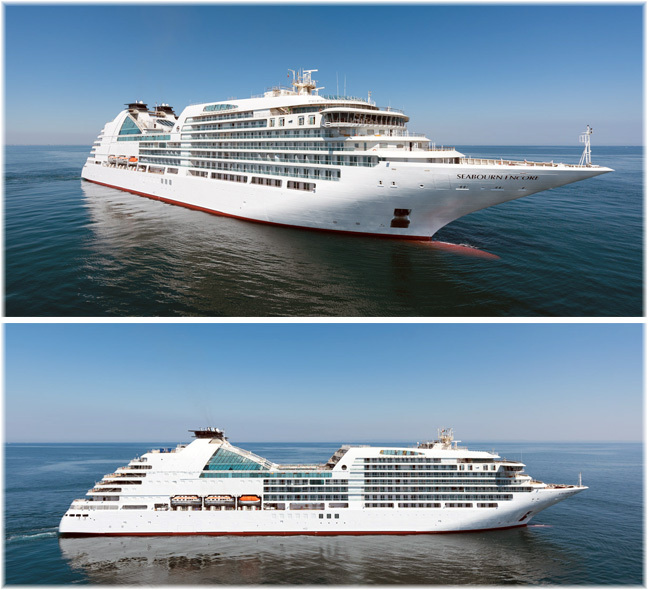 The announcement was made by Colin Au, founding president of Genting HK, which bought Crystal in 2014, during a visit to the German shipyards bought by the company to carry out the Crystal expansion and to build vessels for China-based Dream Cruises. Plans for Crystal Luxury Air have also been pared back, and the order for a Boeing 787 Dreamliner to carry 100 guests in first-class luxury has been cancelled. But designs for the surviving Boeing 777, expected to take to the skies in 12 months’ time, show a restaurant area complete with dining tables separate from the accommodation. The 777 will carry 84 guests on round-the-world air cruises of 14, 21, or 28 days. Elsewhere in the Genting empire, its casinos in Asia are not minting as much money due to an economic slowdown in the region and increased measures by the Chinese government to prevent money laundering. Its main casinos in Malaysia and the Philippines have also suffered from large falls in the local currencies. Genting Hong Kong meanwhile also has to pay for two large and expensive Dream class cruise ships and two more Star ships. These will enter an increasingly uncertain Chinese cruise market, where, a flood of new ships being built for the market is pushing the pricing levels downwards. Genting is wise to be cautious however. Although the terrorist attacks of 2001 are usually blamed for its demise, American Classic Voyages failed in part because of an overly ambitious expansion plan that involved two new cruise ships for Hawaii, a new coastal cruise line and a second cruise line for Hawaii. Others who grew too quickly were Fearnley & Eger (Renaissance 1) and Renaissance Cruises (Renaissance 2), which each introduced eight new ships into the market in rapid succession. And closer to home there was Genting’s own massive expansion of Norwegian Cruise Line post-acquisition that saw the company load up with debt levels that resulted in them selling the controlling interest of the company at a 50% discount to Apollo and the new owners having to re-capitalise to the tune of $1 billion. According to one observer, the price tag for Crystal’s expansion plus the cost of acquisition has now passed the $4 billion mark. Posted in Antarctica, Arctic, Crystal, European River, News, World | Tags: "cruise People"
American Queen had been built by McDermott Shipyard in Morgan City, Louisiana, in 1995 and been laid up since 2008. First of the new trio is ACL’s 185-berth America, an enlarged version of American Eagle and Queen of the Mississippi, also from Chesapeake Shipbuilding. She was delivered in May and is now working together with a second Queen of the Mississippi, the first having been sent to the Columbia River as American Pride. Like all the other ACL riverboats, America is propelled by diesel engines and propulsion is through a stern paddle. Second of the newcomers is French America Line’s 150-berth 4,332-ton Louisiane. 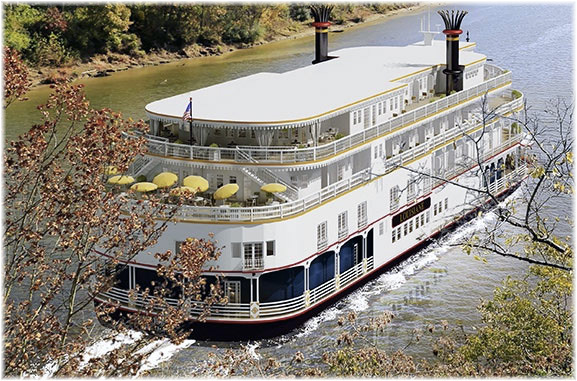 Completed in 2000 as the last river cruiser to be build by the old Delta Queen Steamboat Company, Louisiane was built by Leevac Shipyards of Jenning, Louisiana, and completed by Cascade General Shipyards in Portland, Oregon, for work on the Columbia River. 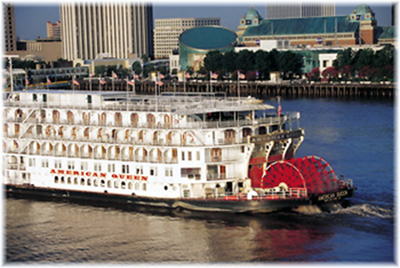 Unlike most other riverboats in the United States, Louisiane is screw-propelled, with propulsion obtained from four diesel engines. This summer, French America Line brought Louisiane around from Portland to New Orleans as deck cargo on a heavy lift sem-submersible barge and she is now at the Bollinger Shipyards in New Orleans (See video), where she is being prepared for her inaugural voyage from New Orleans on October 22. 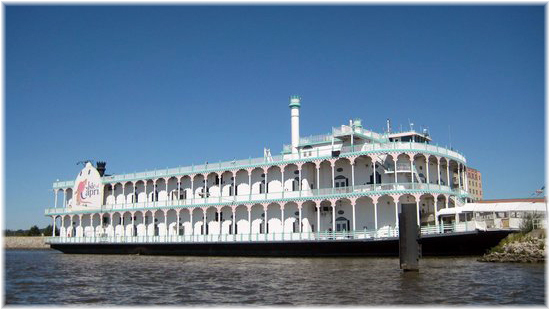 Louisiane will sail from her own dedicated cruise terminal at Gretna, Louisiana, directly across the river from New Orleans. 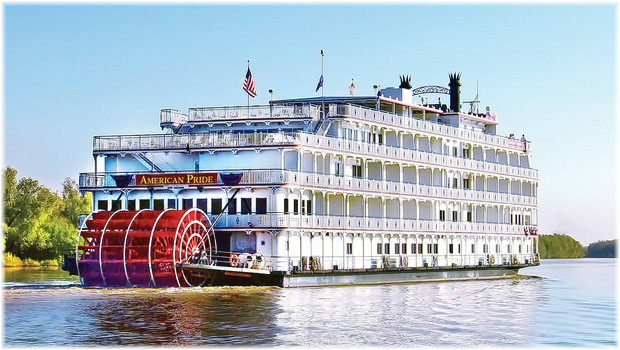 This vessel has been selected from among the American floating casino fleet to become the American Queen Steamboat Company’s third ship, joining American Queen and the 223-berth American Empress, which operates on the Columbia River. Presently called Bettendorf Capri, the vessel has two 10’9″ tall decks, while a third lower height deck will be added atop the ship.